Lately I’ve been dealing a lot with my own body and body dysphoria, and a lot of people have been asking me how I deal with my body dysphoria. To clarify, body dysphoria is discomfort a transgender person experiences with their body because of the disconnect between their body and their gender. Body dysphoria, which I’m going to shorten to just “dysphoria” for this blog post, can be triggered by just about anything, can cause pretty bad mental distress, and is in general a bad time all around for the one experiencing it. Dysphoria is also a deeply personal thing that differs from person to person, and no two people will experience and describe it in the same way. Similarly, no two people will have the same set of coping mechanisms, and not every coping mechanism I use will work for everyone or even anyone else. With that being said, here is how I deal with my own body dysphoria. Somehow, this really helps. The artist Cavetown is trans and his work is heavily influenced by his experiences with dysphoria and his identity, so his music is very relatable. You can find his work (and that of other trans musicians, like Jaime Wilson, Ryan Cassata, Peppermint, etc) on Spotify, YouTube, and other music platforms. When I am experiencing bottom dysphoria, which is body dysphoria dealing specifically with the region below the waist, I like looking at the wide variety of prosthetics many companies offer to help transgender men alleviate bottom dysphoria. Doing this at the very least takes my mind off of my dysphoria, and I can imagine the liberation that having a product like that or bottom surgery would grant me. 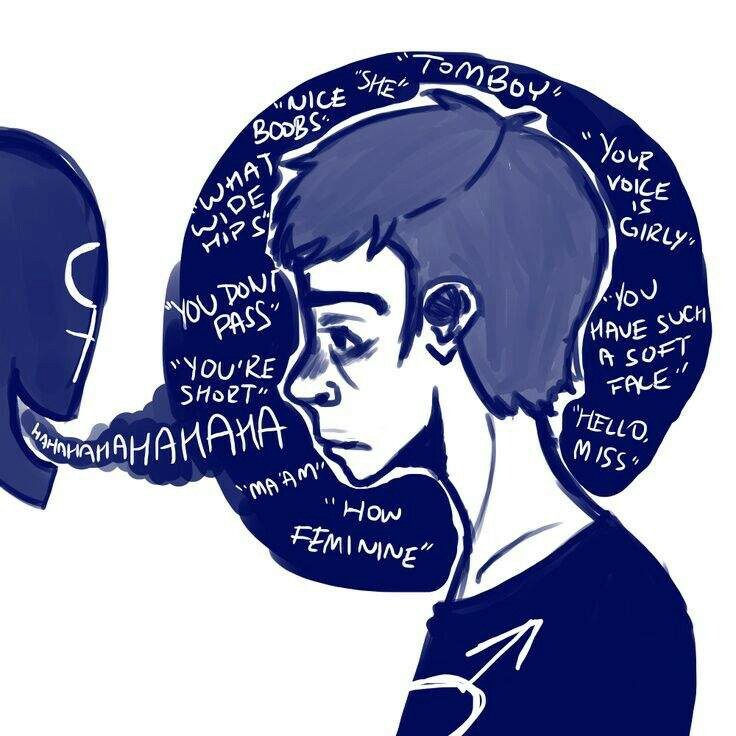 My dysphoria often comes with a feeling of lacking control over my body and my feelings towards it. Changing what I do have control over, my hair and clothing, gives me back the sense of control that my dysphoria was taking away and gives me a much needed boost in confidence. From an entertainment standpoint, watching role model characters helps me to have a solid distraction from my dysphoria. More importantly, however, when there is a character that I heavily relate to, I can almost imagine myself being that character, a cis man, and that helps my dysphoria. These are just my coping mechanisms. I hope these help someone!